Extra Metro trains will be put on this Sunday to help Sunderland fans catch their connections to make it to London in time for the Checkatrade Trophy final. Extra Metro services will be in operation on Sunday morning to help Sunderland supporters connect with mainline trains for their trip to Wembley Stadium for the Checkatrade Trophy final. Nexus, the public body which owns and manages the Tyne and Wear Metro, is running the additional Metro trains from 6.15am to help fans get to mainline stations in Sunderland and Newcastle. Sunderland AFC will take on Portsmouth at Wembley Stadium in the Checkatrade Trophy final this Sunday. The extra services are there to help the Sunderland fans have enough time to spare in order to catch onward mainline services to London King’s Cross, with the big match kicking off at Wembley at 2.30pm. Supporters are still advised to allow plenty of time to make their Metro journeys on Sunday morning. 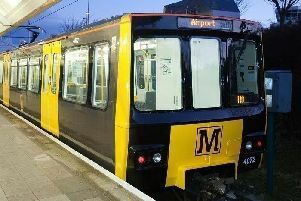 Metro services director, Chris Carson, said: “Extra Metro services are in place from early on Sunday morning to assist the Sunderland fans who need to make connections for the trip to Wembley. “We knew there would be a higher level of customer need on the morning of the game and we have planned and prepared for that with the additional trains. Sunday's Checkatrade Trophy game kicks off at 2.30pm. "The Metro is part of everyday life in our area and that includes helping football fans get to all of the big games. “The first of the extra trains will be in operation from 6.15am on Sunday as we expect more demand at that time, given that the game kicks off at 2.30pm down in London. For more information and updates go to www.nexus.org.uk and Metro’s official twitter page @My_Metro.